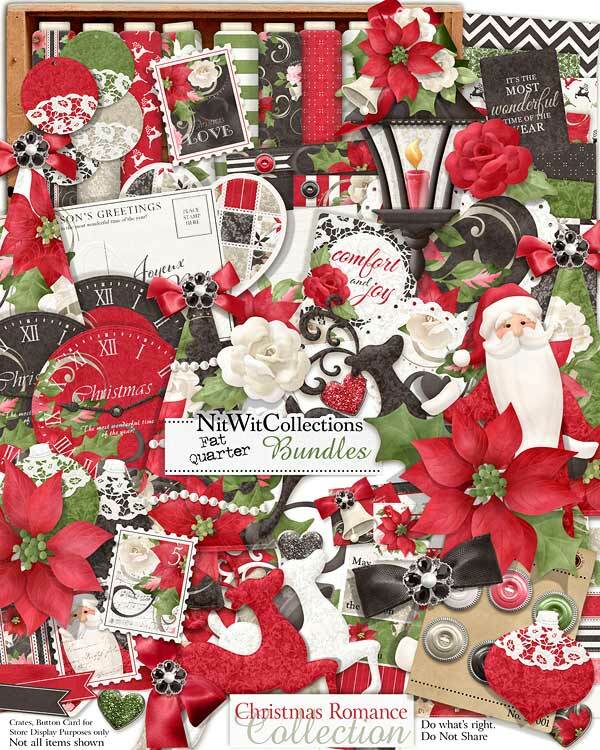 FQB "Christmas Romance" Collection brings an air of sophistication and elegance to your Christmas creating experience! Bold colours, stylish elements and even some sparkle will unfold when you open the folder of this digital Christmas kit. Santa, of course, graces this kit with his long flowing overcoat where he shows you what Mrs. Claus does for her decorations. Poinsettias set among white roses and swirls, reindeer in beautiful silhouette poses, a lantern to the light the way and stamps are just a few of the digital elements that you will want to be sure to include in your Christmas creating. A cottage shabby Christmas kit that we're sure you'll love! 6 Buttons with metal exterior rings are sure to add so much charm to your digital layouts, cards and mini albums! 4 Circle tags with doilies adorning their lower third...how pretty are these?? 2 Father Christmas.. or Santa for those of us in his "inner circle"
5 Floral stickers that are just gorgeous!! Each differently arranged but equal in beauty....these will get many many uses in your Christmas creating!! 5 Hearts with two having lacy perimeters and three that do not....how to choose?? 1 Journal card - "It's the Most Wonderful....."
3 Journal labels that are already lined and ready for your favorite and most treasured memories! 2 Journal labels that are elaborately decorated and ready for you to write on. Can you see these attached to a present perhaps?? 3 Ornaments with intricate patterns and lace tops to ensure that you have a very "shabby" Christmas! 1 Post card wishing your recipient a "Joyeux Noel"
4 Reindeer in silhouette poses in each of the colours of this digital kit. Can you imagine seeing these majestic creatures pulling Santa's sled on December 24?? 1 Stamp with a bold black background to let the flowers shine!